London Festival of Architecture 2015: Turner-nominated architecture studio Assemble has revealed plans to fill a gallery in the headquarters of the Royal Institute of British Architects with a spongy Brutalist-inspired landscape. Assemble, the first collective to ever be nominated for the UK's prestigious Turner Prize for art, will collaborate with British artist Simon Terrill on The Brutalist Playground – an installation and exhibition that will run this summer. Occupying the Architecture Gallery inside the RIBA's building on Portland Place in central London, the work is intended as an abstract exploration of forms found in concrete playgrounds designed for Brutalist housing estates in the 20th century. Many of the playgrounds that were built as part of these developments were later demolished, or were neglected and are no longer suitable for playing in. "The challenge of reconstructing elements of now-forgotten Brutalist play structures within the RIBA gallery is an exciting opportunity for us to explore contemporary issues surrounding play, by looking at the often surreal objects from the past," said a statement from Assemble. "The interpretation of these spaces has allowed us to ask questions around materiality and the nature of risk in play, while also giving greater visibility to the incredible original images of the playgrounds that can be found in the collections," added the architects. Assemble worked with Terrill to find archive material in the RIBA's library, documenting London estates including Churchill Gardens in Pimlico, the Brunel Estate in Paddington and the Brownfield Estate in Poplar. Elements of the sculptured concrete forms that were a recurring feature in the play spaces will be recreated using reconstituted foam, creating an installation that can be climbed on and over. "The original playgrounds evoke a disappearing world of concrete mazes and windswept walkways," said Terrill. "Like a Brechtian stage set rendered in concrete, they speak to a time before soft play and highly regulated public space." "The recreation of these forms is a kind of inverted hyper-Brutalism," he said. "Playable structures reveling in the sharp-edged bush-hammered concrete forms they reference." Photographs of the playgrounds taken when they first opened will be projected onto the walls. 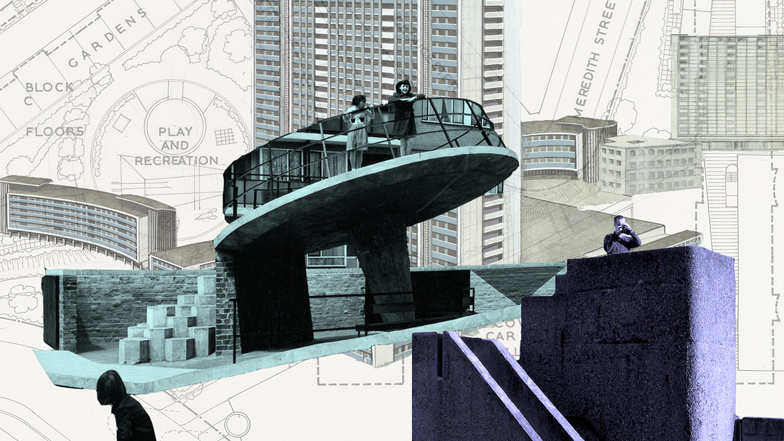 The installation will be accompanied by a program of talks, debates, film screenings, and other events, which will run throughout the London Festival of Architecture from 1 to 31 June. The project is part of a wider resurgence of interest in Brutalist architecture, which is being reassessed as some of its most significant examples come under threat of demolition.